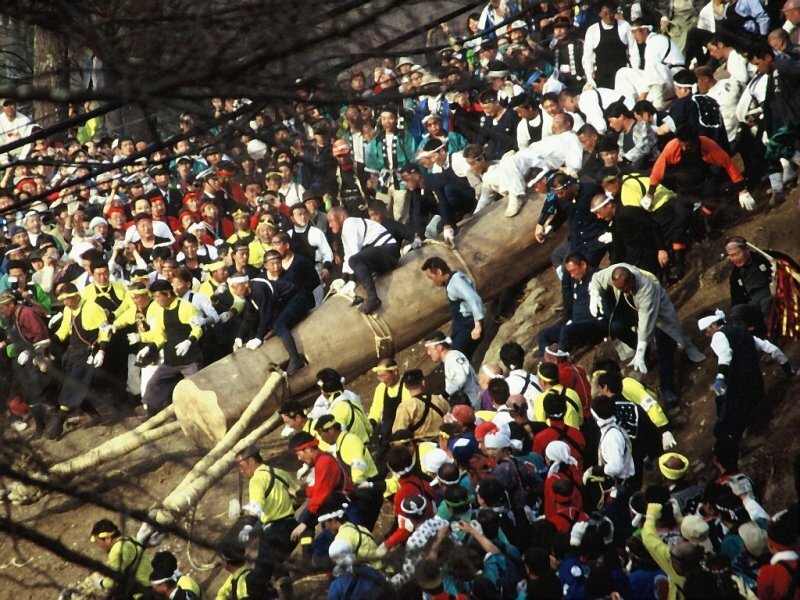 Every six years, men of the Suwa region gather to fell, drag and ride massive logs over challenging terrain to display their bravery and ultimately erect the logs in the buildings of the Suwa Grand Shrine. As a form of spiritual renewal of the holy site, as many as 16 fir trees have to be harvested to replace the pillars of the shrine complex. At 17 meters long and weighing 12 tons, each of these logs is heavier than the largest land animal on earth – the African elephant. Like other festivals in Japan, Onbashira Matsuri in Suwa, Nagano is filled with plenty of singing, dancing, colorful costumes and merrymaking in general. Though unlike the others, this is a dangerous festival where it’s easy to get injured – with deaths happening occasionally. Onbashira is divided into two parts, Yamadashi in April and Sotobiki in May, and next taking place in 2022. Yamadashi is a big extravaganza for tourists to catch. Come April, the logs are cut down and then wrapped in thickly braided ropes to be pulled up the hill. 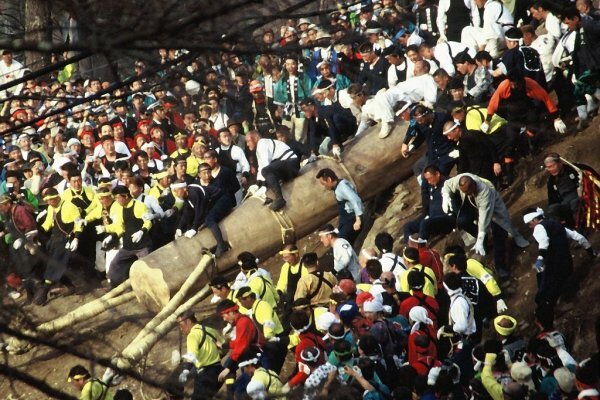 Then comes the death-defying kiotoshi, or log-riding, where local men mount the logs precariously to ride downhill. As men and log hurtle downwards, some of them will inevitably tumble off the sides. 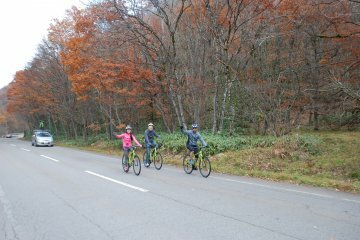 And then there’s more than just traversing a steep slopes on logs. Yamadashi also includes kawagoshi, or river-crossing, where the logs are dragged across the river using ropes. As for Sotobiki in May, the logs will be paraded through the narrow streets to the shrines amidst jolly song and dance. Reaching the shrines, during tate-onbashira as the logs are being erected, some men will be perched right on top of them, paying no heed to the laws of gravity while holding on tight. Because of the sheer spectacle of the Onbashira Matsuri and the seemingly devil-may-care attitude of these young men, the festival has grown very popular over the years with visitors hailing from different parts of the world and Japan coming to catch a sight of it. Access to all the events are free except for the kiotoshi. Due to the dangerous nature of log-riding, and because of the crowd around, those without tickets are highly discouraged from attending kiotoshi for their safety. And if you’re worried about not being able to secure a ticket for the highly sought after kiotoshi, fear not. The Kamisha (Upper Shrine) and Shimosha (Lower Shrine) celebrate Onbashira Matsuri separately. 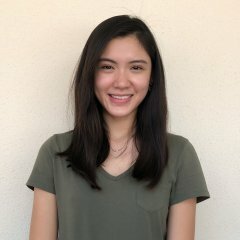 This means each event will happen twice! Do note that while the sale of tickets to the Kaimisha will be open to all, tickets to the Shimosha can only be purchased if you have a Japanese address. While the dates for 2022 have yet to be released, it's likely that the festival will be held in the first half of April and May (so 4 periods of festivities in total since the Upper Shrine and Lower Shrine hold Yamadashi and Satobiki separately). The Onbashira Matsuri is definitely one of the more unusual festivals around. Happening only once every 6 years and coupled with its adrenaline-pumping risky nature, the Onbashira Matsuri makes for an interesting cultural experience. The station closest to the Upper Shrine is Chino Station and closest to the Lower Shrine is Shimosuwa Station. Kamisuwa Station is north to Chino Station with many ryokans there. All three stations are along the JR Chuo Line. From Shinjuku Station, take the JR Chuo Line exp. train to Kamisuwa Station (2 h 35 min). 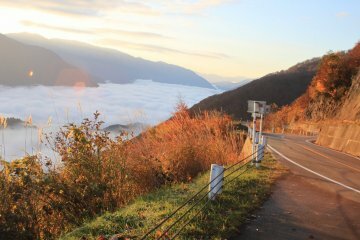 From Nagano Station, take the JR Shinano train line to Shiojiri, and then take the JR Chuo Line to Kamisuwa Station (2 h 45 min). From Nagoya Station, take the JR Chuo Line exp. train to Shiojiri and then continue on the same line to Kamisuwa Station (requires a train change on the same line) (2 h 40 min in total).